These two composers are joined by tragic deaths on opposite sides of the First World War. Stephan, a Munich avant-gardist, was the only soldier in his German unit to die in a September 1915 battle with Russian troops for the Galician town of Stryi. Magnard, a French traditionalist, was either shot or burned to death defending his home from German troops in September 1914. Only 28 at the time of his death, Stephan was little known outside German new music circles and not well liked within them. A young man of strong opinions and no tolerance for sycophancy, he had to pay for his performances and drew little encouragement from the few reviews. On the evidence of his Groteske for violin and piano, written in 1911, he was familiar with the frontier sounds of his times – Berg, Debussy, possibly Bartók – but the voice is entirely his own and the voice never less than urgent. There is every reason to believe he would have flowered into a major talent. 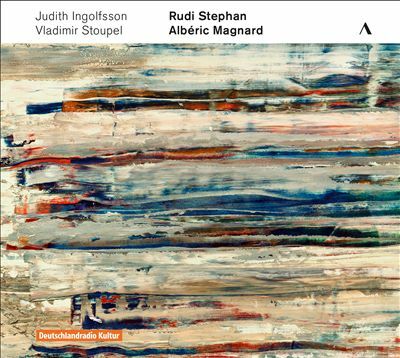 Magnard, more than 20 years older, was in mid-career, nearing 50, with four respectable symphonies in the bag – conservative works reminiscent more of Schumann and Brahms than of his French contemporaries and steeped in romantic naturalism. His 1901 sonata for violin and piano is charming and civilised with two deliciously languorous slow movements. This was not a man who set out to change, or challenge, the world. Many of his scores were consumed in the conflagration of his death. Judith Ingolfsson and Vladimir Stoupel bring the tragic pair vividly to life in the transparent acoustic of Berlin’s Jesus-Christus-Kirche. 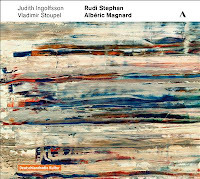 There’s an irresistible lyricism to Ingolfsson’s violin lines and no concession to sentimentality. These are lovely accounts of two rare works that you’ll really want to hear. The one regret is that there are just 55 minutes of music on this disc, too little music for a whole album.